Hi:) I just wanted to let you know that I entered a new challenge :) The challenge is to write a blogpost twice a month about different topics. 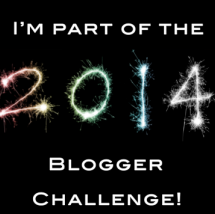 The #2014bloggerchallenge posts will go live during the 1st and the 3rd weeks of each month. Everyone who signs up will be sent an email with the post topics. The topic ideas are there to give us new ideas and encourage us to write about things we wouldn't normally write about. Anyone can get involved, whatever your blog topic! Whether you write about cooking, beauty, lifestyle or fitness. If you participate in the #2014BloggerChallenge, you'll get more blog traffic, discover new blogs and make friends with bloggers you probably didn't even know existed! All you have to do to get involved is write an email to anothergirlyblg@gmail.com with your blog's URL, your name and your email address. Thank you so much:) I will enter! I've also joined in! I can't wait!